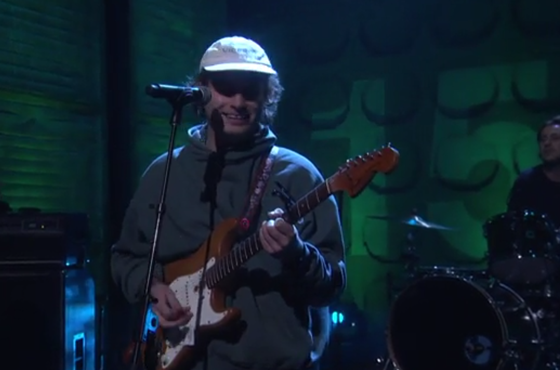 We recently learned a little too much about local lo-fi hero Mac DeMarco in an interview with his mom, but we've always known he's an exciting live performer. He proved that again last night (March 30), making a rare appearance on late night TV as the musical guest on Conan. Backed by his full (but not fully clothed) band, he played Salad Days cut "Let Her Go." Keeping it chill in a hoodie and baseball cap, the laid-back slack-rocker did an admirable and affable job at delivering the stupidly catchy slice of jangle-pop. DeMarco is gearing up for a string of West Coast North American tour dates, and you can see all the details for those over here. Below, watch him perform "Let Her Go" on Conan.